All core TransMagic products come with the Auto Repair Wizard and Lite Repair, giving you CAD repair in seconds flat. By default, every model that is opened is evaluated by the Auto Repair Wizard (ARW) to see if it is a watertight solid, and if there are any underlying issues. In the before-and-after image at right, the ‘before’ image has different default colors for each face or surface; this is an indication that you are dealing with an group of surfaces rather than a watertight solid model. In the ‘after’ image, the color of the model is uniform, indicating that the model is a cohesive solid. Green light? You’re model is healthy and watertight! Yellow light? You have an open circuit somewhere, meaning you have a ‘leaky’ solid. The TransMagic Auto Repair Wizard will try to help you with that, by highlighting open circuit edges and attempting to stitch neighboring surfaces together. Red light? You’ve got more serious underlying issues which Full Repair may be able to solve. In the case of files that are not stitched watertight, the ARW will launch Lite Repair. Here are the steps Light Repair takes on every model it evaluates. In this first step, Lite Repair attaches intelligent attributes to edges and vertices. These attributes assess the boundaries of all faces to determine the best possible repair method. In Geometric Simplification, spline surfaces are converted to analytic surfaces (planes, cylinders, etc.) where possible. Analytic geometry is helpful for downstream operations such as FEA, machining and feature recognition, because it represents geometry in a purer form. Figure 3 – Repair Termination. Repair Termination removes intelligent attributes, bringing file size back down for an efficient solid model. And all of this happens in just a few seconds when you run Lite Repair. 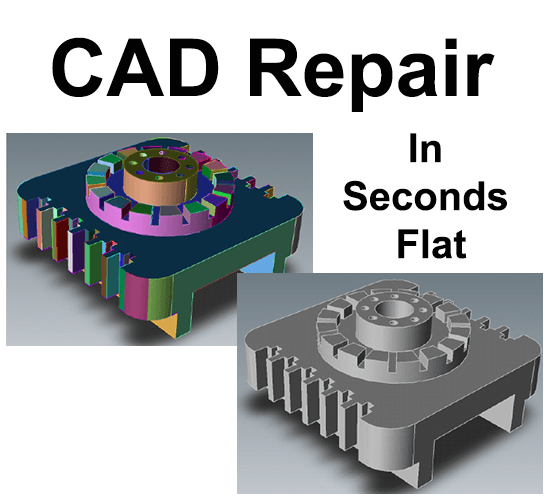 Read out more about TransMagic CAD repair here. Want to try TransMagic repair on your own files? The free eval includes both Lite and Full Repair. Access the TransMagic eval here!